CALIFORNIA Sonoma County's Dry Creek Valley. 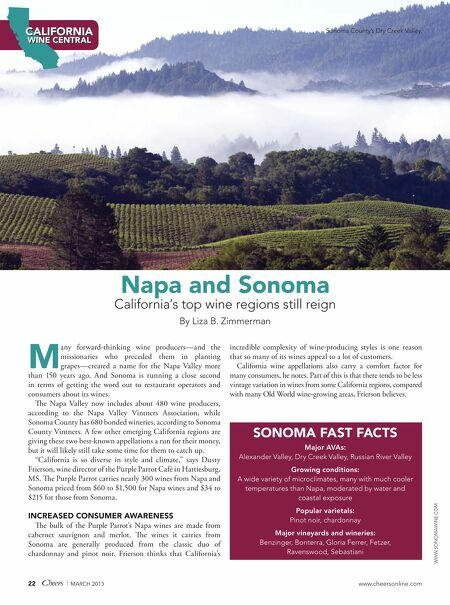 WINE CENTRAL Napa and Sonoma California's top wine regions still reign By Liza B. Zimmerman INCREASED CONSUMER AWARENESS The bulk of the Purple Parrot's Napa wines are made from cabernet sauvignon and merlot. The wines it carries from Sonoma are generally produced from the classic duo of chardonnay and pinot noir. Frierson thinks that California's 22 | MARCH 2013 incredible complexity of wine-producing styles is one reason that so many of its wines appeal to a lot of customers. 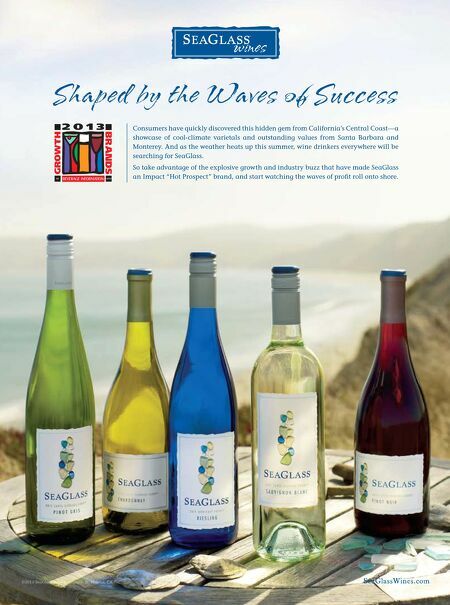 California wine appellations also carry a comfort factor for many consumers, he notes. Part of this is that there tends to be less vintage variation in wines from some California regions, compared with many Old World wine-growing areas, Frierson believes. SONOMA FAST FACTS Major AVAs: Alexander Valley, Dry Creek Valley, Russian River Valley Growing conditions: A wide variety of microclimates, many with much cooler temperatures than Napa, moderated by water and coastal exposure Popular varietals: Pinot noir, chardonnay Major vineyards and wineries: Benzinger, Bonterra, Gloria Ferrer, Fetzer, Ravenswood, Sebastiani www.cheersonline.com WWW.SONOMAWINE.COM M any forward-thinking wine producers—and the missionaries who preceded them in planting grapes—created a name for the Napa Valley more than 150 years ago. And Sonoma is running a close second in terms of getting the word out to restaurant operators and consumers about its wines. The Napa Valley now includes about 480 wine producers, according to the Napa Valley Vintners Association, while Sonoma County has 680 bonded wineries, according to Sonoma County Vintners. A few other emerging California regions are giving these two best-known appellations a run for their money, but it will likely still take some time for them to catch up. "California is so diverse in style and climate," says Dusty Frierson, wine director of the Purple Parrot Café in Hattiesburg, MS. The Purple Parrot carries nearly 300 wines from Napa and Sonoma priced from $60 to $1,500 for Napa wines and $34 to $215 for those from Sonoma.